I’m not really a person who gravitates to the Hair of the Dog. The occasional punch or Ramos Gin Fizz with friends will sometimes fit my mood on weekend mornings, but generally speaking, I prefer a strong, black coffee to start my day. When I do have the occasion to enjoy a long brunch on slow weekend days, I’ve recently started ordering Virgin Marys as my drink of choice. They come quick, burst with flavor even without liquor, and can spice up a couple of fried eggs. And they’re usually about half the price of the spiked version. 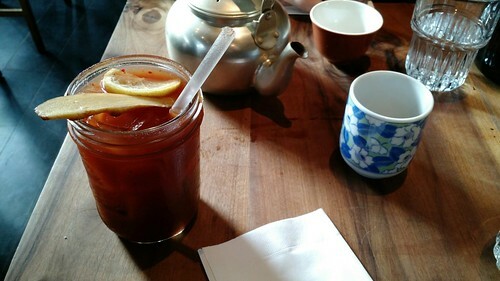 But this all changed when I came upon the Michelada at Namu Gaji. We had come to the Korean-inspired restaurant on a Saturday morning hungry for the clean, comforting flavors of grilled fish, rice, and pickled vegetables. At night, the restaurant offers table service for its elegant plates of Korean American fare, but on weekend mornings, guests can order brunch at the counter and find themselves a seat at the bar along the window, the long communal table, or one of the dozen or so other two tops. And then I saw it on a sign by the cash register: the Michelada. A typical Michelada is a sometimes favorite of bartenders, a dirty mix of beer (often cheap), lime, peppers, and spices. In its rawest state, it can sometimes takes the form of a cold can of Tecate with a wedge of lime and a dosing of Tapatio. But this was not Namu Gaji’s Michelada. Namu Gaji’s Michelada is made from tomatoes—when possible, from the restaurants’s farm in Sonul ag park—gochugaru (bright red Korean pepper flakes), bulldog vegetable and fruit tonkatsu sauce, tamari (aka Japanese soy sauce from miso), wasabi, ginger, and unfiltered Asahi beer. It is garnished with a lemon wheel and a long peel of ginger. I was entranced. And rightly so. The wheaty unfiltered Asahi beer went perfectly with the bright burst of California tomatoes and sweet Korean pepper. Unlike Bloody Marys—which sometimes make the tomatoes, salt, and alcohol feel like fire in your throat—the Michelada offered a milder, more drinkable, slightly effervescent alternative that tasted cohesive. It was everything I actually crave when ordering a Bloody Mary. 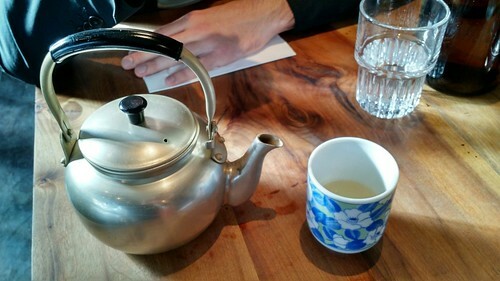 For those who find the acid of tomato juice tough on their stomach, a cup of traditional barley tea is a restorative follow up (in fact, you’ll find the same kind of tea served as a finisher at the three-Michelin-starred Saison on the other side of the City). By the way, if you're into beer cocktails, 15 Romolo is hosting its 5th annual Booze and Beer Brawl event on Feb. 15 at 6 p.m., as part of SF beer week. Some of the city's best bartenders will be competing for the best cocktail of the night, and you get to try each of their creations and then vote. Tickets are $20 in advance or $25 at the door. We often go and wrote about it a few years ago. Enjoy.